ARLINGTON, Texas (AP) Texas traded infielder Jurickson Profar to the Oakland Athletics on Friday in a three-team deal that included Tampa Bay and netted the Rangers four prospects. Oakland also finalized a $15 million, two-year contract with free agent right-hander Joakim Soria, giving the A's a reliable and versatile reliever. He gets $6.5 million next year and $8.5 million in 2020, and he can earn $500,000 annually in performance bonuses for games finished: $250,000 each for 35 and 40. 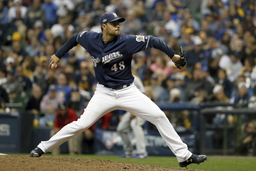 Soria would get a $750,000 assignment bonus the first time he is traded during the contract. Profar, who at 19 in 2012 homered in his first big league at-bat before shoulder issues forced him to miss two full seasons, hit .254 with 20 homers and 77 RBIs in 146 games while playing all four infield positions for Texas this year. In Oakland, he will take over at second base for departing free agent Jed Lowrie. Profar had been expected to become the starting third baseman for the Rangers after Adrian Beltre retired last month. The Rangers acquired right-hander Yoel Espinal and left-handers Kyle Bird and Brock Burke from Tampa Bay, and infielder Eli White from Oakland. Texas also got $750,000 international signing bonus pool allocation from the A's. Texas sent right-hander Rollie Lacy to Tampa Bay. The A's also sent right-handed pitcher Emilio Pagan and a 2019 competitive balance Round A pick to the Rays, a selection projected to be in the high 30s overall. The Rangers had two more seasons of arbitration eligibility for Profar before he can become a free agent. General manager Jon Daniels said there had been discussions about the possibility of an extension but that it became clear that wasn't going to happen. Daniels said the A's had been consistent in their interest in Profar, and with Tampa Bay in the deal it enabled the Rangers to get the full value they felt was needed to consider trading away the player that signed with them as a 16-year-old in 2009. The GM said all four players coming to the Rangers are at the upper levels of the minor leagues and knocking on the door of the big leagues. "There is definitely an emotional piece to this one," Daniels said. "We have seen the ups and downs. Seen the really precocious talent and the big smile and the way he loves to play the game, to looking like he was going to be our second baseman and the shoulder issue that went on for a year longer than I think any of us would have liked it to." Bird and Burke will be added to the 40-man roster for the Rangers. The 22-year-old Burke was selected the Rays' top minor league pitcher after combining to go 9-6 with a 3.08 ERA and 10.4 strikeouts per nine innings in his 25 games (22 starts) on at the High-A and Double-A levels. Fontana was the only of the four to play in the majors this year. He reached the big leagues each of the last two seasons with the Angels, appearing in 20 games in two stints with Los Angeles this year.